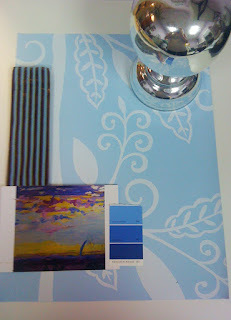 Perhaps it is the heat of the summer that inspired this color combination of cool blues and icey silver. The wallcovering would look fantastic in a powder room or on an accent wall in a formal living room. The paint colors really compliment the artwork and by using a color within the painting, the contrasting colors really pop!